It’s the time of year when every nearby grocer and pharmacist is offering the annual flu shot. But before you were able to get the vaccination, you’ve noticed your sinuses are tender, you have a headache, and you feel exhausted. 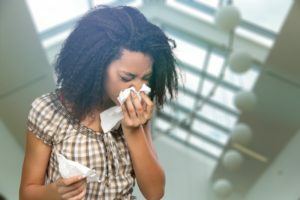 Is it the flu or a sinus infection? Use this guide to find out. When it comes to the flu and a sinus infection, these three illnesses have a few symptoms in common. Here’s what to look for if you’re feeling a bit under the weather. So if you catch yourself experiencing any and all of these symptoms, you’re likely under the weather. After you rule out any allergies, here’s how to recognize the key differences in symptoms between the flu and a sinus infection. When you have the flu, your whole body will be affected by the illness wracking your body. You may experience chills or sweating, a bad fever (though a fever may not be present in all cases of the flu), muscle aches throughout your body, and a general fatigue you can’t shake. You might also experience a runny nose, dizziness, or a sore throat as well. These symptoms can also trigger nausea and vomiting. Sinus infections are usually limited to your head and throat, though fatigue is a common symptom since your body is expending energy to fight off an infection. Sinus infections typically result in pain in the face, particularly in the sinuses. A sinus infection will also cause yellow or green nasal mucus, congestion, headaches, pressure, and bad breath. You may feel like you’re suffering from nose infections or worse. The pain is typically worse when the individual bends over or coughs. The flu comes fast and hard, but a sinus infection may take a couple days to develop strong symptoms. Any sweats and chills you may feel are typically indicative of the flu and not a sinus infection. Match your symptoms to the ones listed above and seek medical attention to get the proper treatment. Chronic sinus infections affect around 37 million people every year. This makes it one of the most prevalent health issues throughout the country. If you’re tired of suffering from ear and nose infections, a balloon sinuplasty might be the best medical procedure for your chronic infections. Visit the best ENT doctor in Florida today: the Gardens Cosmetic Center.